More than a century ago, American writer Mark Twain observed a curious phenomenon at Mono Lake, just to the east of Yosemite National Park: enormous numbers of small flies would crawl underwater to forage and lay eggs, but each time they resurfaced, they would appear completely dry. In his travel memoir Roughing It, Twain wrote: "You can hold them under water as long as you please—they do not mind it—they are only proud of it. When you let them go, they pop up to the surface as dry as a patent office report, and walk off as unconcernedly as if they had been educated especially with a view to affording instructive entertainment to man in that particular way." Caltech biologist Michael Dickinson, Esther M. and Abe M. Zarem Professor of Bioengineering and Aeronautics, became similarly intrigued by these so-called diving flies—scientifically known as Ephydra hians—on a vacation to Yosemite 22 years ago. Now the principal investigator of a laboratory that specializes in insect flight, Dickinson teamed up with former Caltech postdoctoral scholar Floris van Breugel (now at University of Washington) to study the mysterious behavior of the Mono Lake flies. The two have now characterized the unique adaptations of the Mono Lake fly and the mechanisms it utilizes to crawl underwater without getting wet. The work is published in a paper in the November 20 issue of Proceedings of the National Academy of Sciences. "Mono Lake has a very delicate and unique ecosystem," says van Breugel. "Conservationists have fought hard to prevent its loss. We were interested in the Mono Lake flies not only because their behavior is so unusual, but because they are a crucial species for the lake's ecosystem and food web. Mono Lake flies are a crucial component to the local ecosystem, acting as a food source for spiders and for migratory and nesting birds." Mono Lake is not an average freshwater lake. Not only is it three times saltier than the ocean, it's also full of sodium carbonate and borax—which is essentially laundry detergent. The water's high pH gives it a slippery, almost oily texture. No fish or other vertebrates survive in Mono Lake, though algae and bacteria are abundant. Thus, for a fly, the depths of the lake may seem appealing—there are no predators and plenty of food. However, there's just one hurdle to overcome first: how to stay dry while underwater. To something the size of a tiny fly, water's surface tension is powerful, making it a deadly sticky trap. All insects need to be water repellant, or hydrophobic, in order to coexist with rain and dew in their environments. Most are able to accomplish this by sporting a coating of short bristly hairs covered in a waxy substance, which allows them to repel water for the most part. However, due to its peculiar chemical make-up, Mono Lake water is particularly good at breaking through an average insect's hairy defenses. Van Breugel and Dickinson discovered that this is because the surface of the lake contains a thin layer of negatively charged carbonate ions. When a regular fly gets too close to the water, the ions are attracted to positive charges on the fly's skin and the water is pulled between the protective hairs, wetting the fly. So, how can the Mono Lake fly dive and stay dry in what Dickinson calls "perhaps the wettest water in the world"? Using a combination of high-speed video and micro-force measurements in which they plunged flies into a variety of different chemical solutions, van Breugel and Dickinson found that the Mono Lake fly creates a protective bubble of air around its body when crawling into the lakewater. This bubble is a result of an extreme water-repelling phenomenon called superhydrophobicity. 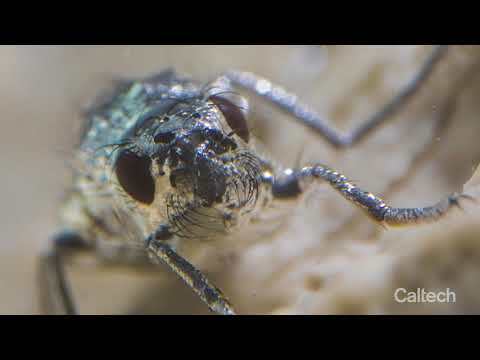 The flies are able to do this, the researchers discovered, because they are hairier than the average fly and coat their bodies and hairs with waxes that are particularly effective at repelling the carbonate-rich water. They also have large claws on their feet, which allow them to crawl on underwater rocks while resisting the naturally buoyant force of the bubble. Remarkably, the bubble does not encase the fly's eyes, allowing the fly to see underwater without the bubble's distorting effect. The team compared the performance of Mono Lake flies to a variety of different flies, including some close relatives. No other flies could take a dunk into Mono Lake water without getting wet to a degree that would make escape from the lake unlikely. Additionally, when the Mono Lake flies were briefly rinsed with a solvent (hexane) to dissolve their wax, they lost their ability to form a superhydrophobic bubble, suggesting that the fly's waxes are critical to this phenomenon. "It's not that Mono Lake flies have evolved a new and unique way of remaining hydrophobic—it's that they've amplified the normal tools that most insects use," says Dickinson. "It's just a killer gig. There's nothing underwater to eat you and you have all the food you want. You've just got to dive in perhaps the most difficult water in which to stay dry on the planet. They figured it out, and so get to enjoy an extremely unique life history. It's amazing how the evolution of such small-scale physical and chemical changes can allow an animal to occupy an entirely new ecological niche." The next steps for the project, according to Dickinson, are broad. "We could go in the materials science direction and study the chemistry of the waxes that the insects use," he says. "But there's also some really interesting neurobiology—it is such an incredibly weird thing for a fly to deliberately crawl underwater." The paper is titled "Super-hydrophobic diving flies (Ephydra hians) and the hypersaline waters of Mono Lake." Funding was provided by the National Geographic Society's Committee for Research and Exploration. A thin air bubble enveloping an alkali fly allows it to stay dry underwater in Mono Lake.